When it comes to using Instagram hashtags, it can be a bit of a touchy subject; some people hate them, and some people love them a little too much. But did you know that posts with at least one Instagram hashtag average 12.6% more engagement than posts without a hashtag? Instagram hashtags are one of the best ways to grow your Instagram account. Using the right hashtag (or combination of hashtags) can help you expose your brand to large and targeted audiences. In fact, your chances of attracting new followers, getting more likes, and increasing engagement are vastly increased by the use of hashtags! Every Instagram post you create can be accompanied by a short message or caption and a few hashtags. The hashtags help organize and categorize photos and video content, which aids the process of content discovery and optimization. For example, a food blogger might post a picture of a gorgeous smoothie bowl, and then use the hashtags #superfoods, #cleaneating, and #vegansofig when it’s uploaded to Instagram. By using these three hashtags, the image is cataloged so other Instagram users who enjoy healthy foods can find it. A branded hashtag is a hashtag that’s unique to your business. It can be as simple as your company name, tagline, or the name of one of your products or campaigns. Or it can be a hashtag that has nothing to do with your brand name, but has everything to do with your brand identity. While community hashtags are meant to increase the reach of your message, branded hashtags are designed to connect themes for you and your audience. They can be used to promote a campaign or aggregate user-generated content (UGC). Community hashtags are hashtags that connect like-minded users around a specific subject, such as #ihavethisthingwithfloors or #fromwhereistand. They’re a great way to connect with others, improve the SEO of your posts, gain followers, and grow your own community. The best way to find these community-oriented hashtags is by looking to see which hashtags your audience, or favorite accounts, are already using. The narrower the scope of the hashtag, the more engaged the users are. For more in-depth information on Instagram hashtag basics, check out our free Instagram Hashtags Strategy Guide! Do you have a system for organizing your hashtags? If you don’t or if your current system leaves much to be desired, you’re probably wasting a lot of time and effort. If you’re trying to capitalize on your Instagram and get more likes and engagement engagement with every post, you should have a system in place! One of the simplest ways to organize your hashtags is by posting them into Google Sheets. The reason we recommend Google Sheets is because Instagram requires you post from a mobile device, and Google Sheets is infinitely more mobile-friendly than Excel. Start by creating a new spreadsheet and adding the following headers: hashtags, category, # of posts, date, and comments. Now enter your hashtags and their relevant info. If using a spreadsheet seems like more trouble than it’s worth, consider using Later’s Saved Captions feature. With Saved Captions, you can create templates to save your most commonly used hashtags. When it’s time to schedule, simply select on of your Saved Captions to add it to your post. Best of all? It’s free to all Later users! In order to be successful with hashtags, it’s important to be strategic about your hashtag usage. The “most popular” Instagram hashtags are just simple words, and while tagging #love, #happy, and #dog may get you a few more likes, it’s not going to do much for your growth in the long run. Instead of using the most popular Instagram hashtags, it’s better to use the top Instagram hashtags that have an engaging community behind them and are specific to your audience. So, how are you supposed to find these cool, creative, and community-oriented hashtags? The best way is to look and see what Instagram hashtags your audience, competitors, and industry leaders are already using. The narrower the scope of the hashtag, the more engaged the users are. You’ll be shocked and surprised by just how niche hashtags can get! For example, let’s say you’re going to post a photo of a French Bulldog. Instead of just tagging #dogstagram (over 15 million posts), you could also tag #frenchie(over 5 million posts) and #squishyfacecrew (over 1.3 million posts) to reach a more targeted audience of people who really love French Bulldogs. This is the best way to get a lot of targeted engagement on your posts! Throwing random hashtags at the end of your Instagram posts isn’t going to grow your audience. Instead, find out what hashtags your audience is using and see which ones fit the content that you’re publishing. Your hashtags should be relevant and contain keywords that users are actually searching for. It’s always smart to find out what hashtags your competitors are using. By doing so, you can determine which hashtags provide the most engagement. While it may not be your intention to compete on those hashtags, you could still end up figuring out what your potential customers are talking about and which hashtags they’re using. And maybe you’ll discover new hashtags to add to your repertoire! One of the best ways to find hashtags you should be using is to follow Instagram influencers that have the same (or similar) target audience as you. For the uninitiated, social influencers are basically the people that tend to perform exceptionally well on social media. Every industry has its respective key influencers. Find out who these people are in your niche and piggyback off their success. These people are already well-established with your target audience, so why not learn from the best? Surveying the landscape of trends that are relevant to your own hashtag is an easy and effective way to grow your community. Simply type your hashtag into the app’s search bar, and then select “tags” from the dropdown menu. You’ll then be able to see all of the top hashtags that are closely related to your own hashtag, revealing additional ways to reach, monitor, and engage with your community. You can also browse through posts containing a hashtag you’re already having success with. Do you see a trend of any other common hashtags that could be included in future posts? If yes, write them down. If you’ve ever searched for a hashtag on Instagram, you’ve probably noticed a grid of nine “Top Posts” that appear at the top of the results page. According to Instagram, Top Posts appear on trending hashtags to show you some of the most popular posts that were tagged with that hashtag. Getting one of your Instagram posts to feature in the Top Posts section is a big deal. Like getting featured on the Explore Page, it can results in a huge network effect that essentially makes your post go viral on Instagram. But unlike the Explore Page, which shows different content for every single user, everyone on Instagram sees the exact sames Top Posts. So the opportunity to go viral is maybe even bigger! So how do you actually get on the Top Posts for a hashtag? Let’s start by discussing how Instagram selects which posts to feature as Top Posts. While no one knows exactly how the Instagram algorithm works, we do know that Instagram favors posts with high engagement, meaning that the more likes and comments your post receives, the more likely it is to feature in the Top Posts. Check out the search results for the hashtag #makeupjunkie. Most, if not all, of the posts in the Top Posts section received over 4000 likes and 50 comments. But the amount of engagement a post receives isn’t the only factor that Instagram takes into consideration. Another factor, which is just as important, is how quickly your post receives its engagement. Top Posts generally take their position within the first 24 hours of posting, so you need those likes and comments to roll in quickly after posting. If you can generate a lot of engagement on your Instagram post shortly after posting, this signals to Instagram that your post is quality, engaging content. The first step is picking the right hashtags to trend for. If you’re a smaller account with 10,000 or less followers, you’re much more likely to trend for smaller, highly targeted hashtags like #fashiongoals than you are for a massive hashtag like #instafashion. Once you’ve picked the right hashtag, you need to focus on getting as much engagement on your post as quickly as possible. And one of the best ways to do this is to schedule your Instagram posts for when your audience is most active on Instagram. If you post when your audience is most active on Instagram, you’re more likely to drive engagement on that post. That engagement will translate into Instagram bumping your post higher up on users’ feeds, which, in turn, will result in even more engagement on your post. It’s a cyclical process: higher engagement leads to more visibility, which leads to higher engagement, which leads to more visibility… and it all starts with when you post on Instagram. If you want a shot at trending, you also want to include 3-5 “big” hashtags that are less targeted but generate a lot of likes and comments. Some examples are #instagood, #photooftheday, and #vscocam. These “big” hashtags should still be relevant to you, but they should have a ton of posts and a high amount of engagement (lots of people searching for them). A branded hashtags is a great way to start a conversation with your followers and increase the reach of your content. Branded hashtags are a way for your “fans” to share with their followers how they are already engaging with your brand, and for you to inspire user-generated content (UGC). It can mean major growth for your followers and help with the overall engagement on Instagram. As we mentioned earlier, a branded hashtag is a hashtag that’s unique to your business. It can be as simple as your company name, tagline, or the name of one of your products or campaigns. Or it can be a hashtag that has nothing to do with your brand name, but has everything to do with your brand identity. A great example is Herschel’s #welltravelled hashtag, which the global accessory brand uses to encourage their fans to upload photos of the adventures they experience around the world. When creating your own branded Instagram hashtag, remember to keep it simple and catchy. It should be short and easy to spell so that your fans and customers can easily remember it — but also relevant and creative so that people will be enthusiastic about sharing it! Hashtags that are either funny, cleverly constructed, or both are also much more likely to leave a lasting impression. Check out Nike’s recent #airmaxday hashtag campaign for inspiration! They invited their followers to upload photos with the hashtag to celebrate the 30th anniversary of the Air Max 1, and ended up with over 350,000 photos being submitted in just a few weeks! Contests structured around UGC are all the rage, and with good reason: they’re fun, popular, and great for both driving engagement and reaching a new audience. Create a contest where your followers upload photos on Instagram and tag their post with your branded hashtag. Instagram is a community built on the power of visual storytelling. It’s where the world captures and shares its moments through imagery. A branded Instagram hashtag can inspire your community by creating a destination for people to share and collect beautiful and meaningful content. Taking your followers behind-the-scenes is a great way to build a deeper connection with your brand, and one of the best ways to do this is with a branded Instagram hashtag. Keep your followers in the loop about company news and product launches, or simply give you audience a peek at how your brand does what it does — from the people to the product. If you’re hosting an event, pick a hashtag beforehand and encourage your followers to share content surrounding it on Instagram. It will help drive participation and engagement, and will also organize all the posts that are tagged with it on a hashtag page. As creative hashtag projects grow in popularity, having an active branded hashtag that your customers actually want to use is the pot of gold at the end of the Instagram rainbow. By including the appropriate hashtags in your posts, you can effectively reach new people interested in your products. The key is to use branded hashtags that not only describe your photos and business, but entices users to purchase. Using Instagram hashtags strategically is a great way to connect with customers, find content created about you by your followers, and build long-term relationships with influential partners! Keeping up with age demographics for advertising is an ongoing process. With that in mind I periodically update this post with the best information that I can find! If you have any great data I am missing, please shoot me an email … tara(at)marketingartfully.com. This post was updated August 2017. Customer demographics are about how old your customers are. 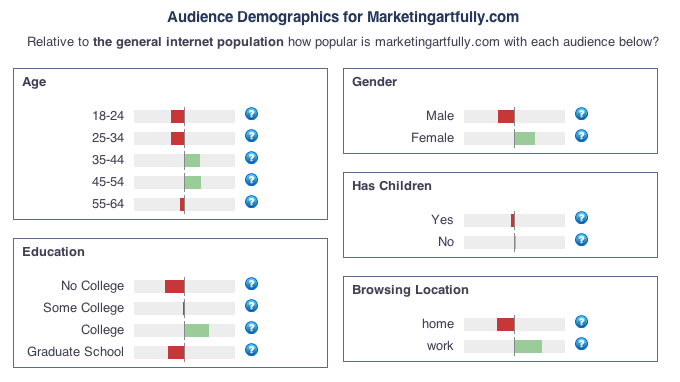 It may surprise you to know HOW much age demographics for advertising effects your marketing efforts in this always on world. 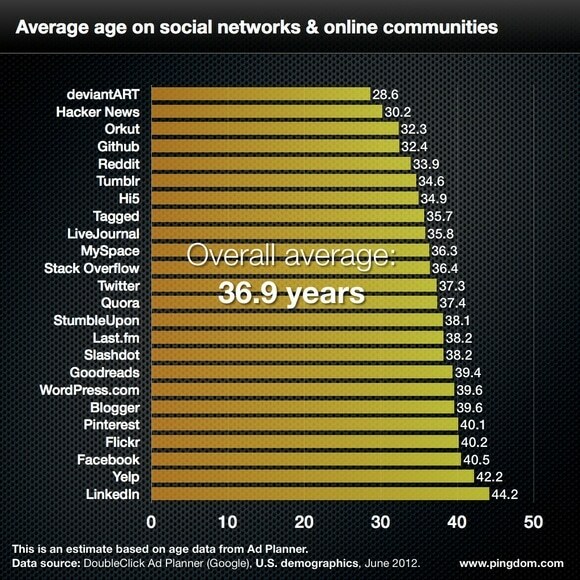 SOME TELLING DATA FOR SOCIAL MEDIA MARKETING…. So how do those age demographics effect your marketing campaigns? A pop quiz, which group uses email least, young people (12-17) or the old dears in the 65+ category? If I had to guess, I would have thought that older people who can struggle with technology and who did not grow up with it are less likely to be reading their gmail. Come to find out, the young people almost never use email! They like the immediacy of instant messaging or texting! a great post from the New York Times about how time spent on e-mail rose 15 percent for people 55 to 64, and was up 17 percent for people 65 and older. So what does that mean for you, my reader who are mostly college educated, women between the ages of 35-54 (site statistic data from alexa.com). First off, I have men readers (I know because they make comments!) and I have readers who are a little older or a little younger than that, BUT primarily I attract people who are like me! Marketing nuts who are similar in age demographics to me (workaholic woman, college educated, 46 years old). So if we take a peek at the age demographic data, my best social media response would come from WordPress (my blog), Pinterest, Facebook, and LinkedIn. Pretty on the money although Twitter does alright by me too! 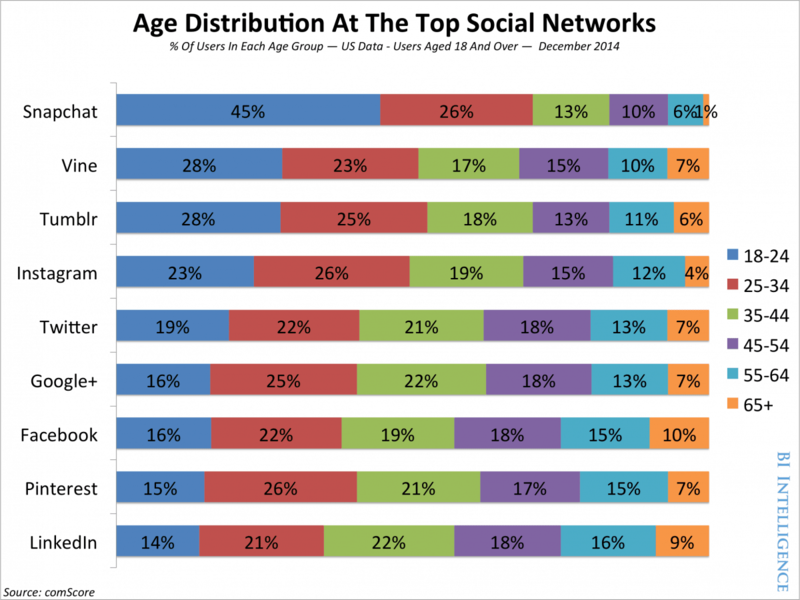 It is somewhat difficult to find current information about age distribution for the different social media networks. BUT I have started collecting this info from over the years to see the changes over time. Please note the dates of this data before citing it. 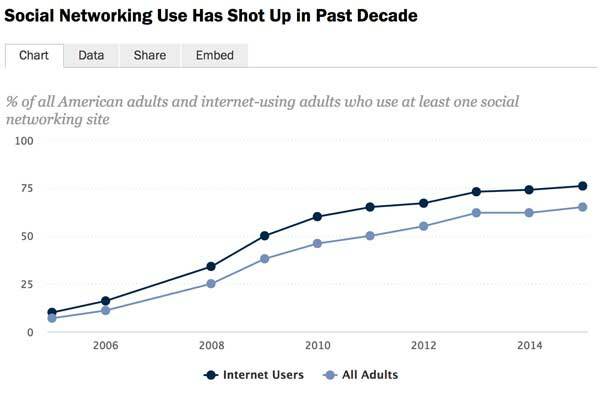 Pew Research graph from 2015 showing the progression of social media.